Waltham A-11 Navigation (Hack) Watch Manual – I Already Have a Watch. I came across this a while back and finally got around to putting it online over the weekend. 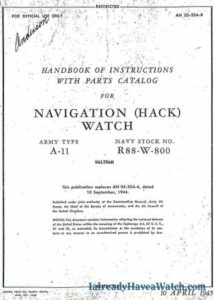 It’s a complete scan of the original 1945 USAAF, USN, and RAF use and service manual for the Waltham A-11 Navigation watches, also known as hack watches for the then-novel feature of being able to stop the second hand to “hack” the time setting with a common time source. The manual covers the operation, use, and even service of the Waltham A-11. The A-11 was perhaps the most commonly issued US military watch of the WWII era. It was most commonly issued to pilots and aircrew for air navigation use, and was also provided to the British Royal Air Force and even the Soviet Red Army under lend-lease and military aid programs during the war. As the manufactureres used various movements and case components, there are separate publication for covering A-11s by Waltham, Hamilton, Elgin, etc. This particular addresses the Walthams only. If you find this interesting, you may also want to check out TM 9-1575, 6 April 1945, which is the US War Department Ordnance maintenance manual for military watches, stop watches, and clocks for the period. Tagged with A-11, Military Watches, reference.